Barrett-Jackson, The World’s Greatest Collector Car Auctions, will showcase its eclectic Salon Collection, featuring rock legend John Lennon’s 1956 Austin Princess, during the 46th Annual Barrett-Jackson Scottsdale Auction, to be held January 14-22, 2017, at WestWorld of Scottsdale in Arizona. The Barrett-Jackson Salon Collection is only available at the Scottsdale auction and showcases some of the world’s most rare, valuable, collectible and coveted vehicles. John Lennon’s 1956 Austin Princess (Lot #1380) includes the original, signed registration by the rock music legend. 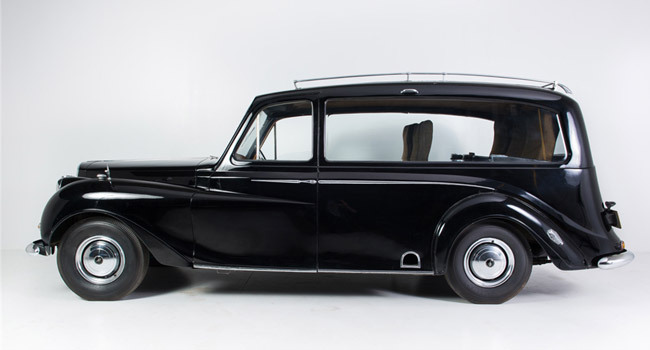 Purchased as an Austin hearse by Lennon in 1971, it was used extensively in the documentary “Imagine” before being customized with two rows of airline seats. The car was personally selected by Lennon because the doors opened to a wider angle, allowing for a quick escape from throngs of adoring fans. Also a part of the prestigious Salon Collection is a 1930 Delage D8 Cabrolet (Lot #1379). Built by the renowned French coachbuilder Henri Chapron, this Delage is the only Chapron-bodied D8 C known to survive today. It was restored by LaVine Restorations in Nappannee, Indiana, and includes an extensive history covering its ownership and restoration, along with correspondence from Delage registrar and historian Peter Jacobs. Other noteworthy Salon Collection vehicles include a ’33 Auburn 12 161A Salon Phaeton Convertible (Lot #1383). One of the rarest Auburns produced, the Murphy-inspired coachwork features long, sweeping lines, a tall grille and a characteristically short windshield. It carries original Lycoming V12, which was one of the most powerful engines offered in 1933 for a street car and set several speed records that stood for several years. Lot #1382, a 1932 Rolls-Royce Springfield Phantom II Henley Roadster by Brewster and Company, has been recently restored from the ground up, including the distinctive wire wheels. The epitome of classic elegance, the car has new leather and carpeting inside and a freshly painted exterior in dark blue custom urethane paint.